The shape of a Pringle, mathematically speaking, is called a hyperbolic paraboloid. Artists have been folding paper into this shape for years. The twist? Hyperbolic paraboloids shouldn’t exist in origami—it’s impossible to make such a 3D shape using only the creases pressed into paper by hand. By that logic, some of Erik Demaine’s artwork shouldn’t exist either. The shape of a Pringle, mathematically speaking, is called a hyperbolic paraboloid. Artists have been folding paper into this shape for years. The twist? Hyperbolic paraboloids shouldn’t exist in origami—it’s impossible to make such a 3D shape using only the creases pressed into paper by hand. By that logic, some of Erik Demaine’s artwork shouldn’t exist either. Demaine, the world’s top computational origami theorist, has created a series of sculptures by folding concentric squares into square pieces of paper, alternating mountain and valley, and folding the diagonals. 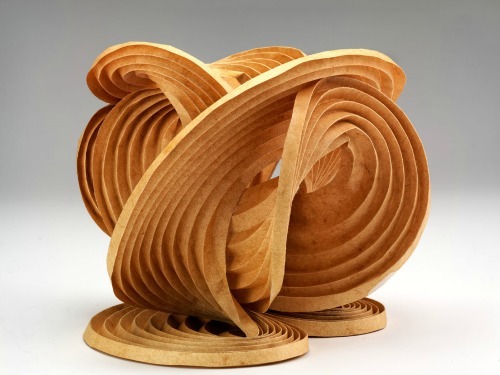 With each sculpture, the paper pops into a saddle shape called a hyperbolic paraboloid and stays there. Its accordion-like folds are pretty to look at, but Demaine, a computer science professor at MIT, isn’t sure how it works. Once the paper is folded, the entire structure settles into a natural form. “Physics finds that balance,” Demaine says. But, the mechanisms of the Pringle-like shape are still poorly understood. Demaine posits there must be little creases in the paper invisible to the naked eye, as handmade folds alone can’t account for the end shape. Trying to solve this mystery means marrying sculpture and mathematics. “We’ve come up with a math problem that inspires new art—and an art problem that inspires new math,” says Demaine. The 31-year-old artist creates his origami sculptures with his father Martin. The final product, “Green Cycles” (pictured at top), was created using two different colored sheets of French-made Mi-Teintes watercolor paper, bonded together. Using a ball burnisher, which is essentially a ballpoint pen without the ink, the Demaines pushed the two-layer sheet into rings of concentric circles carved into a wood template. The paper is scored along the circular creases and cut into a donut shape, before it springs into a three-dimensional form. 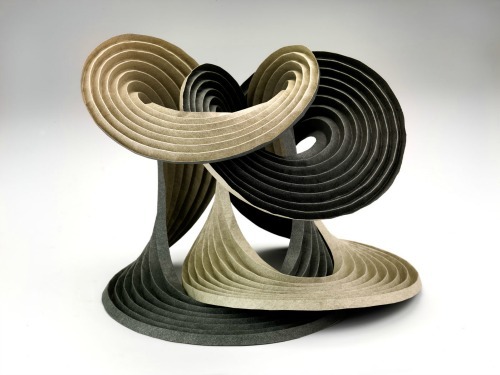 The artist creates several of these models and loops them together into an interlocking paper sculpture. The younger Demaine says the hardest part is assembly, which takes up to a week, because they can’t predict if the resulting shapes will twist around one another to create a solid, aesthetically pleasing piece. “We get them to interlock, let go and let them relax, sometimes overnight, if we think we have a candidate sculpture,” he says. If the structure droops or falls apart, the pair tries again. Written instructions for paper folding first appeared in 1797 in Japan. Akisato Rito published a book, Sembazuru Orikata, with lessons for 1,000 paper cranes. Adachi Kazuyuki published a more comprehensive how-to collection in 1845. By the late 1800s, kindergarteners across Europe began folding colored squares in class. The concept was simple: no scissors, no glue, no tape—just nimble fingers bending and twisting paper into novel shapes. Origami became a modern art form in the 1950s, when Akira Yoshizawa, a Japanese artist, combined the mechanics of the craft with the aesthetic of sculpture. He created more than 50,000 paper models, never selling one. Since then, artist Eric Joisel’s crinkled lifelike animal and human figures appeared on display at the Louvre and physicist-artist Robert Lang’s detailed compositions have been exhibited at the Museum of Modern Art. But paper folding doesn’t just create something we can ooh and aah at. It also plays a role in answering long-standing questions in math, like the fold-and-cut problem. The first known record of the problem appeared in 1721 in a Japanese book of brain teasers, one of which asked the reader to fold a rectangular piece of paper flat and make only one straight cut to produce a Japanese crest called sangaibisi, which translates to “three-folded rhombics.” The author offered a solution through a diagram, but the problem remained an open question for centuries—how many shapes are possible?—until Demaine solved it. As it turns out, any shape is possible—swans, horses, five-pointed stars. All that’s needed is a geometric blueprint, a guide about folding here and bending there. 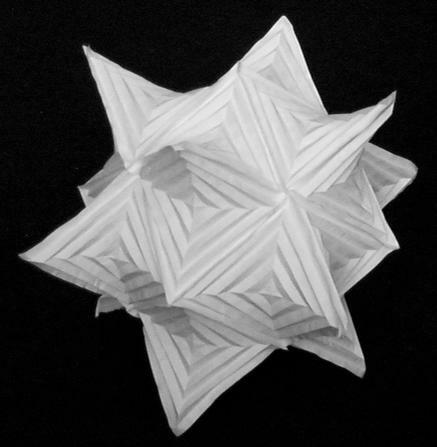 The use of such blueprints added complexity to origami. In the 1960s, folding diagrams involved 20 to 30 steps. Now, a model could require 200 to 300 steps from start to finish. That’s a lot of folding for a single piece of paper. But, the trick is using super thin paper with long fibers, which give it strength to withstand all the pulling and tugging. Computer programs have only added to the fun. TreeMaker, a free software program created by artist Robert Lang, takes user-generated line drawing and churns out patterns that can be printed out and folded to create the shapes. Origamizer allows users to design a 3D model and alter its crease patterns on the screen, exploring different shapes and forms. With the help of computer software, origami has expanded beyond the art world. Scientists and engineers have found practical applications for paper folding. Car manufacturers, for instance, use origami mathematics to compute a crease pattern for folding airbags into flattened shapes. Demaine says origami structures could influence nanomanufacture, spurring the creation of flat intel chips that can spring into 3D shapes. He also met with members of the National Institutes of Health last year to discuss how the craft could help design synthetic virus-fighting proteins. Linking mathematics and art does carry some occupational hazards, though. “A few paper cuts a year,” Demaine says. Three works by the father-son team are on display in “4o Under 40: Craft Futures,” an exhibition at the Smithsonian’s Renwick Gallery through February 3, 2013.